In the Asia-Pacific region there is a high concentration of people living in coastal areas and river basins, which makes them highly vulnerable to the impacts of climate change and related natural disasters. Climate variability is projected to increase in the region, with many countries already facing intensifying extreme and unpredictable climate events such as increased flooding and drought. Many of these observed effects may be attributed to climate change. Developing economies in the region are particularly vulnerable to the impact of climate change on economic sectors and livelihoods. USAID’s Regional Development Mission for Asia (RDMA) established USAID Adapt Asia-Pacific with the objective to enable developing countries in the Asia-Pacific region develop the necessary capacity to access climate adaptation financing. All 13 Asian countries (Bangladesh, Cambodia, India, Indonesia, Lao PDR, Maldives, Mongolia, Nepal, Philippines, Sri Lanka, Thailand, Timor-Leste, and Viet Nam) which were identified as priority countries for USAID Adapt Asia-Pacific involvement all have some form of climate change action plan. The purpose of this document (written in 2012) was to highlight the variety of projects which had already been identified by each country and by major donors, to examine the extent of readiness (availability of concept papers, costing, pre-feasibility studies, implementing agency, source of funding etc. ), to identify the most promising points of entry (i.e. countries that are “project ready”) as well as to indicate the possible capacity-building requirements. The document includes an analysis of financing sources, potential adaptation project interventions by sector, and adaptation opportunities within investment projects. Based on this analysis, the criteria for assessing possible USAID Adapt Asia-Pacific involvement was proposed. An outline of the approach and some of the key findings are provided below. See the full text (download from the right-hand column) for much more detail. Are there sufficient adaptation projects identified by the selected countries that are still not funded? Can the countries directly access external financing? In which case, ADAPT Asia-Pacific can work directly with the project implementing agencies to improve the project proposals and facilitate access to the relevant adaptation funds. If direct access is not possible, can ADAPT Asia-Pacific work with financial intermediaries, such as the UN agencies and multilateral development banks, to assist the countries in accessing adaptation funds? If the specialized adaptation funds are not sufficient or not available, are there other financing options that can be considered? If there is a surplus of both projects and financing sources, what criteria should we use to prioritize project selection? The first step in the analysis was to examine the national action plans and to determine the extent to which specific adaptation projects had been prepared. While there is an understandable emphasis on water resources and food security related sectors, the number of projects / activities proposed for infrastructure and urban planning and development appears low. The Asia Development Bank analysis shows that there has been a recent shift towards funding climate change projects and technical assistance although there is less evidence that “traditional” infrastructure projects are routinely being “climate-proofed”. Road Infrastructure (especially in mountainous, deltaic, or coastal areas). Water Resources Development (especially in areas subject to drought or flood risks). Urban Development (in coastal zones, river valleys, mountainous areas). Railway Sector Projects (through mountainous or flood-prone areas, and possibility of heat impacts). Agriculture and Livestock Projects (heat sensitive crops and livestock, flood and drought impacts, disease vectors, carbon dioxide concentration impacts). The next step in the analysis of the identified ADB projects was to contact the individual task managers to inquire further into the terms or reference or results of the project preparatory technical assistance (PPTA) to determine if the projects have already anticipated the need for climate change adaptation. Following this analysis, the priority projects for discussion with ADB for possible intervention in 2012 were identified. These can be seen in Table 5 on page 13 of the full text. 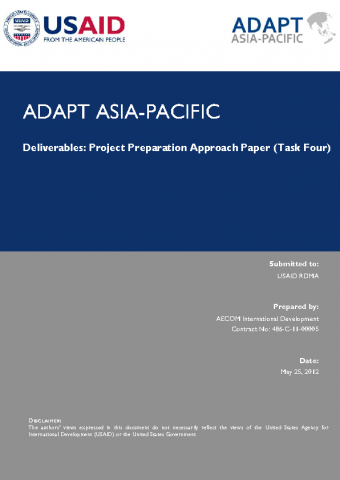 USAID Adapt Asia-Pacific (2012) Project Preparation Approach Paper. USAID Regional Development Mission for Asia: Bangkok, Thailand.